What are the supported snap points for manual dimensions ? "Error: Unable to recognize all points. Some Points will be deleted after detail"
A. End points - when they are taken on the object contour. Any end point on it (including the contour defined by features) is recognized by smart dimensions, and if the model has any modifications (features change position/shape or are removed), the manual dimension will update. 1) End point defined by a scewed cope. 2) End point defined by the flange visible line. 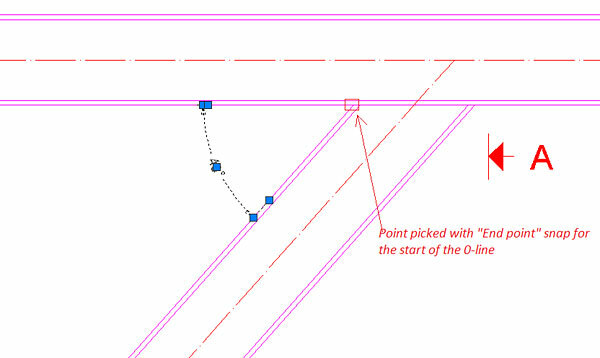 B) System line end points can be dimensioned with the snap point: Node or End point. C) Midpoints - when they are taken on edges perpendicular on the dimension direction. 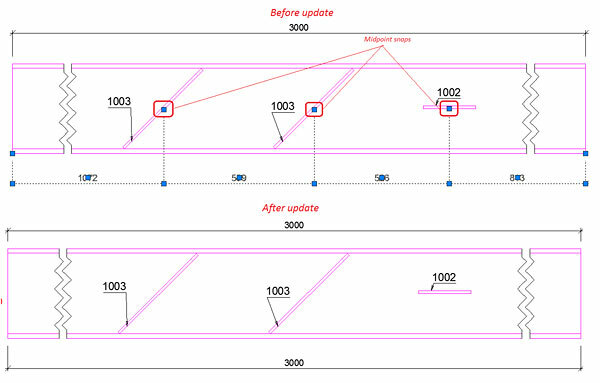 Note: after update, the snap points that were taken on the midpoint move to the closest dimension line end point of the object on which the midpoint was initially chosen, location change does not affect the correct dimension value. If the midpoint is taken on an edge which is not perpendicular on the dimension direction, then the dimension points are removed after update. D) Center snap points are used for hole/bolt dimensioning. 1. The dimension line is created on two holes/bolts that mark the extremities of the pattern, in the dimension direction. If there is more than one hole/bolt at one extremity, then any of them is supported, and the dimension line does not change to a similar hole during update. 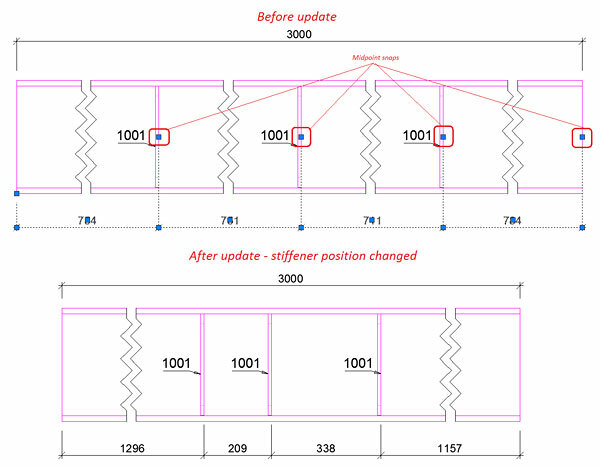 -	We can take only one dimension point from the hole/bolt pattern as long as it is at one of the extremities of the hole/bolt pattern in the dimensioning direction. -	If any of the two points is incorrectly picked, then it will be removed during the update without affecting the other dimension points in that chain. -	Any additional hole/bolt center snap points chosen from in between the extremities, as long as we do not choose all of them (see next point), are removed during update without affecting the correct snap points. 2. The dimension line is created on all the holes/bolts forming a pattern. 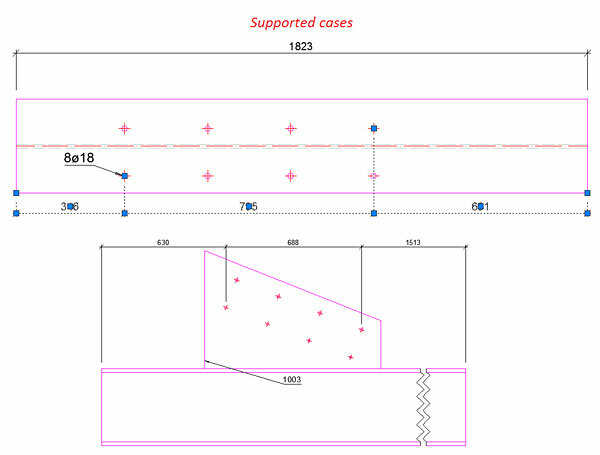 In this case, if additional bolts/holes are added to the pattern, the manual smart dimension will update and dimension these bolts/holes as well, even if a point for them was not picked during the initial dimension creation. The holes/bolts picked must be on the same side of the pattern, otherwise the intermediary points are removed during update. 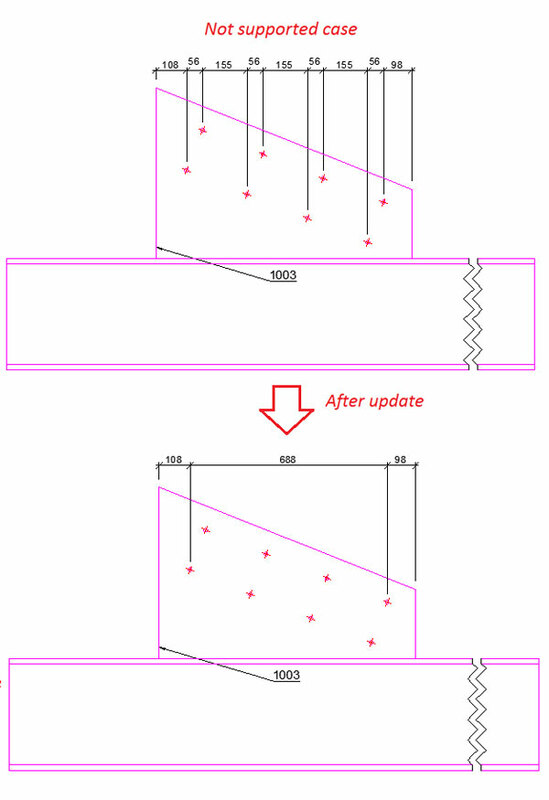 Also, the dimension direction must match the bolt/hole pattern direction; otherwise the intermediary points are removed during update. 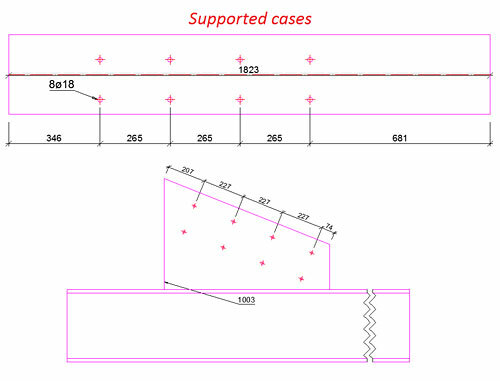 Angle dimensions: the condition is to use an End Point snap for the start of the 0-line, while the end of the 0-line, and the dimensions points can be created by using the "End point" snap point or the "Nearest" snap point.